I know what you’re thinking. I only drink hot chocolate and even if I’m not drinking the hot chocolate, I’ve only bought it for the gram. But as an actual grown up adult now I want to desperately like coffee and drink more of it. When people say they can’t start the day until they have a cup of coffee, I want a little bit of that too. Will I instantly feel more awake and motivated for the day? Because your gal needs it more than ever right now. In all seriousness though, when Greggs contacted me to take part in a coffee taste test challenge for fairtrade fortnight, I could hardly say no. Greggs is more than just your go to for pizza slices and bacon and cheese wraps, even though that’s all I’ve ever known them for since uni. So on my quest for the best tasting cup of coffee, I worked my way round 5 of the biggest coffee retailers including Greggs. My chosen drink was a Cappuccino, hot chocolate powder on top mandatory. Rating scale: 1 being poor, 5 being World’s best cup of coffee. The underdog of the coffee world. I was impressed. To be completely honest with you, I didn’t know what to expect from Greggs coffee, I DO see them as the maker of delicious baked goods, and rather naively look past everything else. I’ve never bothered to try anything else except a bottle of Oasis in the past. Visually, the cappuccino was super frothy which I love, is it bad that the froth and chocolate powder is one of my fave bits? It did come in a paper takeaway cup which was a bit disappointing seeing as I was staying in, but nevertheless it certainly didn’t detract from the taste. I’m not just saying this because it’s a paid post with Greggs, but it really was one of my favourite blends. It was smooth, not too strong and the froth to coffee ratio was just spot on. They use a unique blend of mild, high grown Arabica beans from Peru and Colombia and rich tasting Robusta beans from Tanzania. Fairtrade, and delicious! Where price is concerned, the Greggs cappuccino came in at the cheapest, not even pushing the £2 mark. It offers excellent value for money and honestly was one of my favourite coffees. The only thing that did put me off was the paper cup, as sitting in I did expect to get it in a ‘proper’ cup. However, the ceramic snob in me didn’t let it put me off, as it didn’t alter the taste for me in any way. 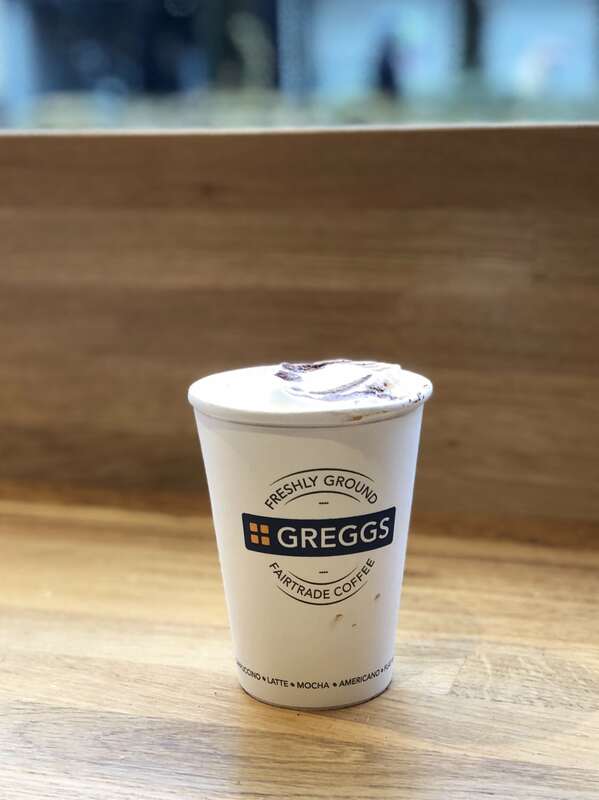 Greggs is typically known as the ‘to go’ place, perfect food and drink for when you’re on the go, it’s just so convenient. They also do certain deals where you can get a hot drink and a cake for something ridiculous under £3, I mean, it would be rude not to, right? Yes! It was the first thing that I saw on the walls in store when I was placing my order, promoting the fact that it was also fairtrade fortnight. In fact, all of Greggs hot drinks are fairtrade certified from their flat whites to their hot chocolates and tea. 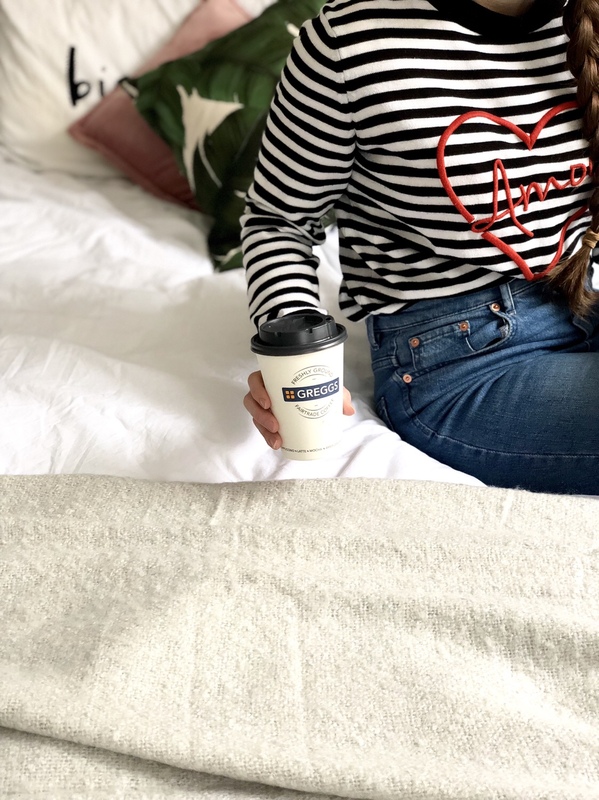 For their coffee, you can sleep easy that every coffee bean Greggs uses is 100% fairtrade and each cup of coffee is made with a unique blend of freshly ground arabica and Robusta coffee beans which are slow roasted to create a delicious, full flavour. During fairtrade fortnight which runs from Monday 26th-Sunday 11th March, Greggs are a key player, they’ve been a fairtrade partner for over 10 years and in this time have donated more than £1 million through coffee sales alone, wow! It’s gotta be called Costa Coffee for a reason, huh? Well, it definitely didn’t come in as one of the greatest tasting, for me anyway. For the looks factor, it probably would have made it to Instagram if they’d used one of their fancy stencils which I know they DO in other stores. It was deliciously frothy on top with lots of chocolate dusting. It had a strong and bitter taste, for me. Which for one of my first cappuccinos probably put me off trying one there again. 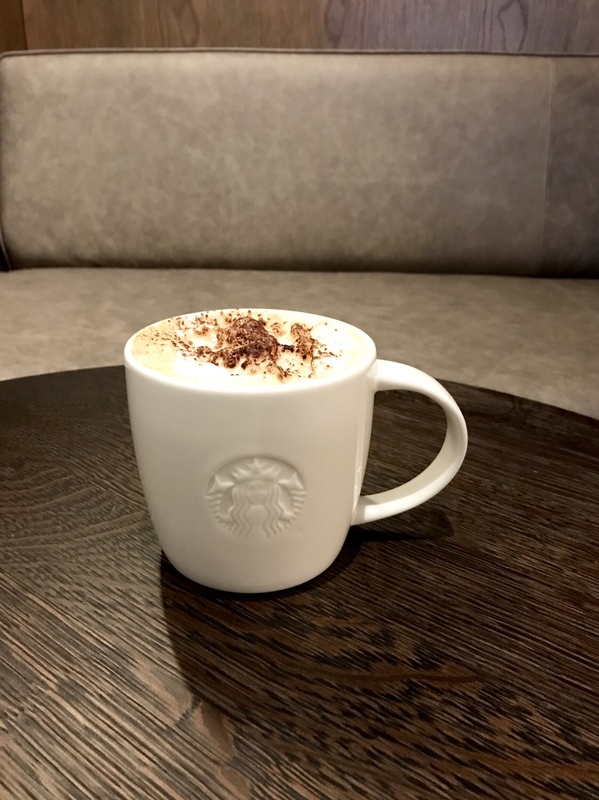 They pride themselves on the fact that it’s one of their frothiest coffees and it features 3 shots of their Mocha Italia, followed by a warm blanket of silky milk and dusting of chocolate. Coming in at the most expensive in the taste test, the price definitely justifies the size of cup that you get, but it wasn’t my favourite. I think the likes of Costa Coffee and Starbucks tend to get away with the higher prices because of their reputation and trust they have built up over the years, but look beyond that and the cheaper and marginally better coffees you can get elsewhere really are just as good, if not better. 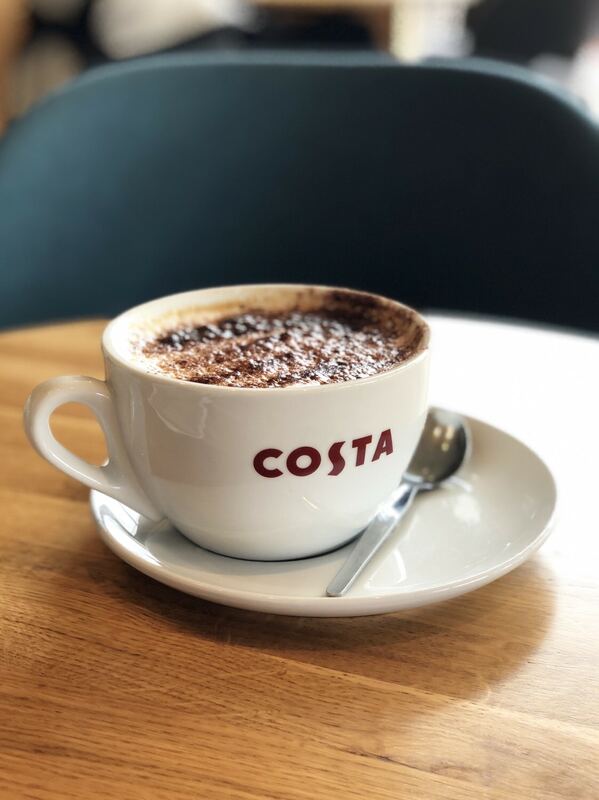 I’m a huge fan of Costa’s loyalty card though, so really with every purchase you make you’re getting a little bit back to get something FREE later down the line, even if it does take me 2 years to get £3 back. They were clearly advertising fairtrade fortnight in store and whilst it wasn’t initially apparent to me in store that everything was sustainable (I blame being sidetracked by work..), everything can be found under the header responsibility on their site – “All of our coffee is 100% Rainforest Alliance certified™, bringing healthcare, education and sustainable crops to our farmers, workers and their families ensuring their land is taken care of in the best possible way”. They promote the fact that they care about the communities they serve and grow in, and that’s all we need to know! 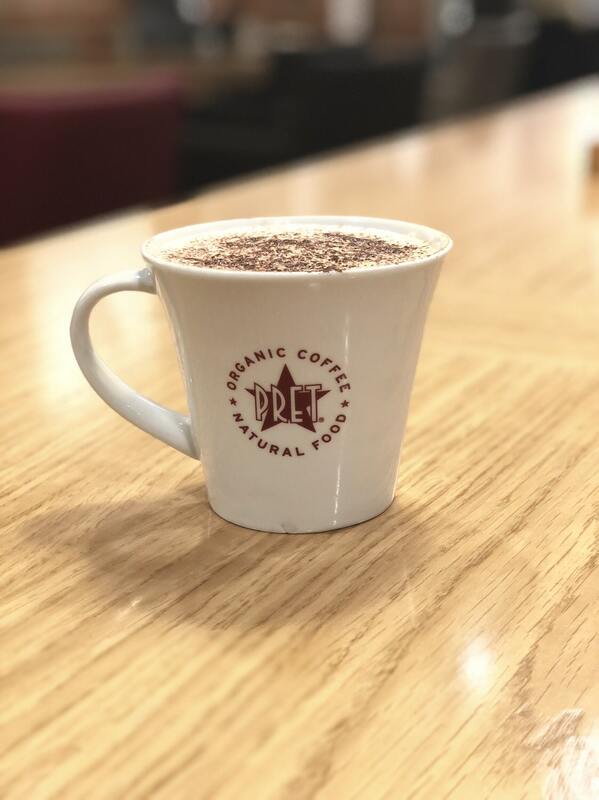 Maybe I’m still getting a taste for coffee and its strength, but the Pret Cappuccino was my least favourite. It wasn’t that it was awful, just far too strong in taste for me and incredibly bitter. I just about tolerated the stuff. Visually it was nice, just like the others with plenty of froth and chocolate dusting powder on top. But for me, the taste was just not enjoyable. This blend starts with a full shot, letting some air sneak in during the steaming process, this makes it foamy and a little lighter than a Latte. In doing this, a Cappuccino is stronger to taste (more air, less milk). I think it offered good value for money, it was a fair sized cup and in comparison to the others, it was cheaper. It wasn’t initially obvious to me that they were sustainable as it was featured in quite small writing on posters to say that they are ‘organic and ethical’. However, it is as clear as day on their website where all the information on their organic coffee can be found in one click. All of their coffee cups also state ‘organic coffee’ (see picture below), so there really is no missing that! They’re proud to be “building long-term relationships and sharing knowledge that supports sustainable farming practices”. All of their organic coffee uses a careful blend of Arabica beans from Peru, Honduras, Sumatra and Ethiopia. For the visual factor it was nice and frothy and comes with a sprinkling of chocolate powder on the top. Not one that would make it to the gram for me, but it still looks good. This cup of coffee was made with espresso (2 shots) with steamed milk, microfoam and dusted with chocolate powder. Out of the 5 it definitely comes in as one of the most strongest tasting cups with a slightly bitter tang and a bitter aroma. I’d probably usually opt for something a little smoother, unless you wanna be jittering for the rest of the day that is..
Coming in as the most expensive cappuccino I came across in the taste test, it was a little overpriced for the size compared to the other places. Don’t get me wrong, I don’t mind paying for a really great tasting cup of coffee, however, it definitely didn’t come in as my number one cup. 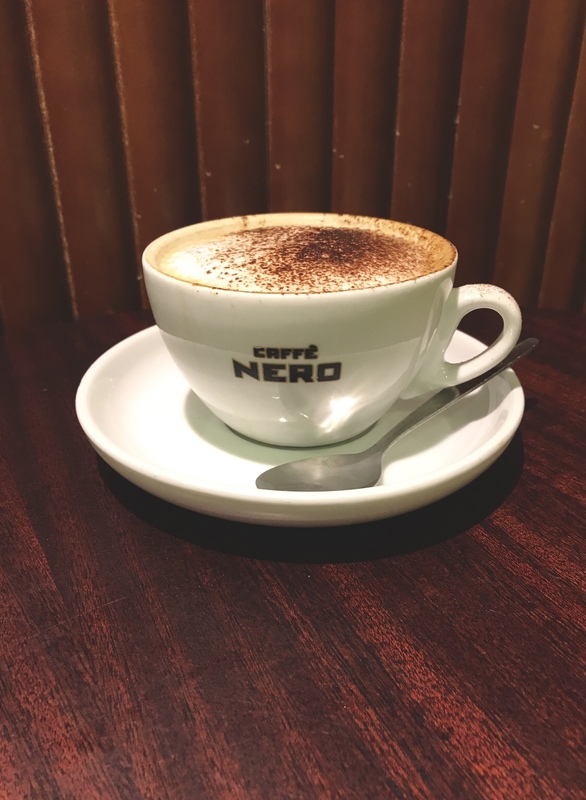 Caffe Nero work with Rainforest Alliance which encourages sustainable livelihoods for farmers. “At present the vast majority of the beans in our unique blend are sourced from identifiable and traceable sources, and we purchase every bean that way”. It wasn’t ‘obvious’ in store that their coffee is sustainable or that it was fair-trade fortnight, but it was easy to find online if you needed to. The cappuccino in Starbucks uses steamed dark rich espresso (2 shots) combined with steamed milk topped with a layer of foam with chocolate dusting powder on top. It has a nice smooth blend, not too strong for me and as you can see, it’s visually a nice foamy/frothy looking coffee. You get what you expect from Starbucks, I don’t think I’ve ever ordered a bad hot drink from there. For me, Starbucks is the mothership of the coffee world. So when you compare the price of this to some of the other coffee retailers, it’s bloody good value. You get a good substantial sized coffee for the price and it tastes great too. By clicking “Responsibility” on the home page of their website this brings up all the relevant information you need to know about their coffee. They state that 99% of their coffee is ethically sourced and is accredited by Fairtrade in some of their large European markets. “We know our supply chain inside out bringing you unique sustainably produced coffee from across the World”. In store there was a Fairtrade fortnight poster on the noticeboard above the the napkins/sugar/milk station – the perfect placement to find everything you need to know before you drink your coffee. Don’t get me wrong, I’m no coffee snob or expert, yet. But from taste, visual appeal, value for money and sustainability, the taste test was certainly an eye opener. I’m only sorry I didn’t try the likes of Greggs first, the moral of the story is, don’t judge a book by its cover. What’s your go to place for a cup of coffee? Does the sustainability of your coffee affect where you would purchase a coffee from? *This is a paid post in collaboration with Greggs, but all opinions are 100% my own.